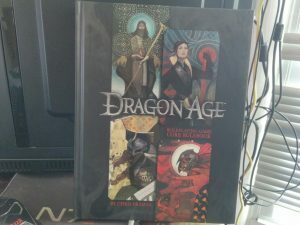 In the Mail: Dragon Age: Hard in Hightown. Dragon Age: Hard in Hightown is an elaborate Dragon Age II joke. One of the NPC companions — one of the cool ones — is a Dwarf named Varric who writes lurid novels, when he’s not shooting the greatest shotgun in the universe a crossbow. One of these novels was called Hard in Hightown, and you would get references to it in-game, because Varric put everybody he knew in the book, including all your other NPC companions and, oh yeah, your own character. So somebody decided to actually publish the book; and Mary Kirby got tapped to, ah, ‘co-write’ it. The entertaining part? I read part of it before I handed it off to my wife (she’s much more of a Dragon Age fan than I was). It was not half bad, what I read. Got a decent pulpy mouth-feel to it, really. I respect that. My games (Dragon Age and @TimeWatchRPG) at @Washingcon are up. WashingCon schedule here. My Saturday game (Dragon Age) here, and my Sunday game (TimeWatch) here. Gonna be a busy weekend, but that’s OK. To be honest, I’m not going to know very many people there anyway. 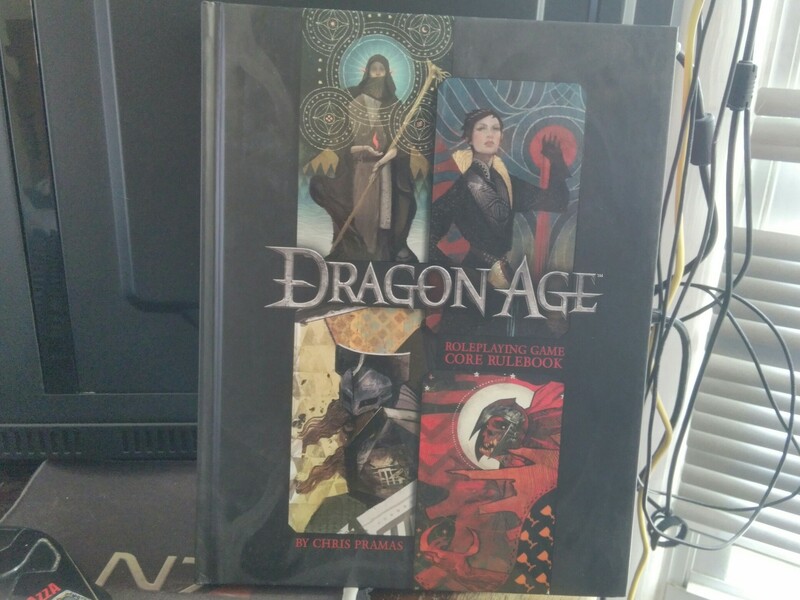 In the Mail: The Dragon Age RPG Core Rulebook. I’m going to look over it for a week or so and decide whether to run a game in it for WashingCon. I’m not sure that I’m familiar with the actual rule set that the Dragon Age RPG uses, for one thing. I also don’t know whether I want to run a slugfest, which may be the tacit default option here. I’ll mull it all over for a bit. New Witcher, Dragon Age Inquisition DLC. Neither being the big ones, but Game Plus and The Descent might prove of interest. To be honest, I’m not in a rush to get either. Issue 12 of The Secret World is about to drop and I’m getting along in Elder Scrolls Online*: and when those are done I’ve got a bit of a backlog. I can always revisit The Witcher: Wild Hunt and Dragon Age Inquisition later. There’s really not much of a rush, honestly. *It’s fun, once you actually get to play it (after downloading the double-digit gigabytes’ worth of patches). Why lie? I was busy playing Dragon Age. Finally got around to sitting down and playing the new DLC. Pretty cool, so far. I should do the DLC’s main adventure at some point. The Dragon Age / Mass Effect Companions, rated worst to best. There are 43. The rankings from #42 to #2 are absolute bull[expletive deleted]. But #43 (the worst) is spot-on, and so is #1 (the best). No, really. I tested this. With SCIENCE. Which is to say, I asked my wife, and she confirmed both the best and the worst Companions without breaking a sweat. So that’s three data points, right there. Amazon Gold Box Deal of the Day: Dragon Age Inquisition. Because it’s Cyber Monday , and because I’ve been playing Dragon Age Inquisition since it came out and it’s been damned fun to play, so that 25% off is a good deal even if you do have to wait for the patch like I’m doing right now. Reminder via Instapundit: and, remember. If you’re buying stuff on Amazon this holiday season, make sure that you buy it via an affiliate link from your favorite site. This goes for lurkers, too: even if you hate me there’s certainly somebody out there who you do like who could use the ad revenue. Every little bit helps.